Billing has always been a thorn in any major telecommunication company’s side. Customers are rarely happy when paying for their phone plan, especially when many aren’t very transparent about what they are being charged for. This is where usability and empathy step in. 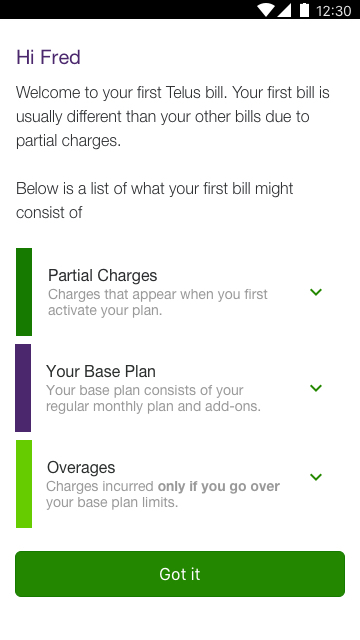 We were tasked with redesigning the TELUS app’s current billing system to make it both clearer and friendlier for customers. Before designing our solution, we must figure out what the real problem is. Through the analytics team, we found out that most support call volume revolved around two main billing themes: Understanding their first bill, and wondering why their bill was higher than expected. Through this, we could extrapolate that there were two pieces missing from the current experience; one being first bill education and the second being information hierarchy. We validated this assumption through customer interviews and customer call verbatims. The old design was very basic as it just listed out line-items in the bill divided by who incurred the charge. There was also no first-time bill education. From customer testing, we realized that they had almost no context as to what they are paying for and also what charges were part of their plan as opposed to extras. We were able to design a content strategy though multiple sketch and ideation sessions between us and real customers. This strategy tackled both first-time bill education and information architecture of the bill. Using research results, we designed a solution that covered the three main charges that customers may see on their new bill. Charges that carry over from when the customer activates to the end of their billing cycle. This may be confusing to customers as they don’t understand that their plan activation date may not coincide with their monthly bill cycle. Charges based on the plan they have chosen. This does not change from month to month. Sometimes going over plan limits can happen even with the customer’s first bill. We decided it was a good idea to prepare them for that. Breaking down the bill was a harder task than the educational piece. Through multiple iterations and testing, we realized that the main pain-point was the informational hierarchy. Customers did not know what they usually are paying for versus what was extra. The only point of reference they had was the dollar amount on their bill. This was a base-level breakdown of the customer’s bill. it included the dollar amount owed and visualization which clearly outlines what is part of the customer’s base-plan vs their additional charges. Helps customers understand any extra charges. A full list of charges for each customer. This hierarchy also helped with scanability of the bill. Where if the customer was okay with the Bill Dollar Amount section, they could just pay right away. As opposed to if they had an unexpected amount, they could just scroll down to know exactly why in the What’s New section. User testing both in-store and through formal facilities proved the current redesign and educational pieces effective. Although the outcomes were positive we acknowledged that we must keep in mind customer feedback in production. This is because when the customer is in a testing environment, there isn’t much risk. With this in mind, we are actively monitoring all customer feedback channels in order to address any design improvements that can be made.